The May 2017 edition of the Economic Update, presenting the current economic environment across the globe and the outlook by Atradius Economic Research. Global – Global GDP growth is forecast to accelerate to 2.9% in 2017 and maintain at 3.0% in 2018. Eurozone – The eurozone’s recovery appears to strengthen but the medium-term outlook is weaker due to political uncertainty and structural weaknesses. Advanced Markets – GDP growth in the US and the UK is supported by robust consumption. 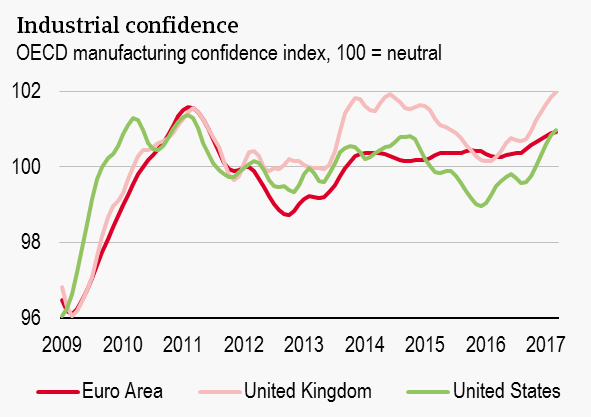 The US outlook is stronger due to a cyclical upswing, while higher inflation and political uncertainty are feeding into lower growth in the UK. Emerging Markets – Emerging markets face reasonable growth rates this year, as a number of key countries emerge from recession. However, the Trump presidency poses significant downward risks to some emerging markets. Credit and insolvencies – The corporate insolvency environment is expected to remain relatively stable in 2017, but is still subject to downside risks, mainly due to the from the impact of political uncertainty on investment and credit conditions. Table: Macroeconomic indicators for key markets. Atradius offers much more than just Credit Insurance for your receivables. With its many detailed publications on the status of the economy, as well as the Country and Industry reports available on our website, you can always be updated on the latest global business trends.